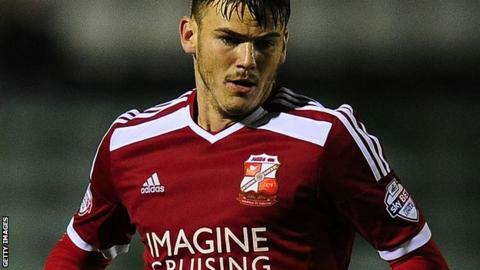 Ben Gladwin's goal stretched Swindon's winning run to four games. Swindon snatched a late win over Fleetwood Town to record their fourth straight win. Swindon were effective on the break early on, before Fleetwood dropped deeper to nullify the hosts' attacking threat in a first half of few chances. Jonathan Obika and Massimo Luongo went close in the second period as the hosts dominated a lacklustre Fleetwood. Substitute Ben Gladwin struck late with a bullet header from close range, as Swindon closed the gap to Bristol City. Swindon sit second in the league, and trail by a single point to leaders City. "We had to be very patient because Fleetwood made their intentions perfectly clear from the start and to try and get away with a point. "We had to concentrate for the whole game and make sure we didn't get caught on the break. "We kept our discipline, the chances started to come late in the game. "I thought we looked a really good team at times." Match ends, Swindon Town 1, Fleetwood Town 0. Second Half ends, Swindon Town 1, Fleetwood Town 0. Attempt missed. Stephen Dobbie (Fleetwood Town) left footed shot from outside the box is close, but misses to the right from a direct free kick. Massimo Luongo (Swindon Town) is shown the yellow card. Substitution, Fleetwood Town. Nick Haughton replaces Steven Schumacher. (Swindon Town) wins a free kick in the attacking half. Corner, Fleetwood Town. Conceded by Amari'i Bell. Goal! Swindon Town 1, Fleetwood Town 0. Ben Gladwin (Swindon Town) header from the centre of the box to the top right corner. Assisted by Harry Toffolo. Corner, Swindon Town. Conceded by Stephen Crainey. Attempt blocked. Nathan Byrne (Swindon Town) right footed shot from outside the box is blocked. Attempt blocked. Massimo Luongo (Swindon Town) right footed shot from outside the box is blocked. Attempt missed. Ben Gladwin (Swindon Town) right footed shot from outside the box is close, but misses to the right. Corner, Swindon Town. Conceded by Stephen Jordan. Attempt blocked. Andy Williams (Swindon Town) right footed shot from outside the box is blocked. Foul by Michael Smith (Swindon Town). (Fleetwood Town) wins a free kick in the attacking half. Substitution, Swindon Town. Ben Gladwin replaces Yaser Kasim. Tyler Hornby-Forbes (Fleetwood Town) wins a free kick in the attacking half. Jack Stephens (Swindon Town) wins a free kick on the right wing. Foul by Tyler Hornby-Forbes (Fleetwood Town). Attempt missed. Harry Toffolo (Swindon Town) header from the centre of the box is close, but misses to the left. Substitution, Fleetwood Town. Tyler Hornby-Forbes replaces Tom Hitchcock. Attempt missed. Stephen Dobbie (Fleetwood Town) right footed shot from the centre of the box is just a bit too high. Corner, Swindon Town. Conceded by Antoni Sarcevic. Substitution, Swindon Town. Michael Smith replaces Jonathan Obika. Attempt saved. Nathan Byrne (Swindon Town) right footed shot from the right side of the box is saved in the top right corner. Attempt saved. Andy Williams (Swindon Town) right footed shot from the left side of the box is saved in the centre of the goal. Attempt saved. Jonathan Obika (Swindon Town) left footed shot from outside the box is saved in the bottom right corner. Corner, Swindon Town. Conceded by Conor McLaughlin. Attempt blocked. Andy Williams (Swindon Town) right footed shot from the left side of the box is blocked. Gareth Evans (Fleetwood Town) is shown the yellow card. Gareth Evans (Fleetwood Town) has gone down, but that's a dive. Jeff Hughes (Fleetwood Town) wins a free kick in the attacking half.